EAC works to protect the unique waters and coastal resources along Marin County's coastal zone that is defined by the California Coastal Act and generally extends inland 1,000 yards from the mean high tide line of the sea. This zone is essential to support healthy and diverse marine life. Coastal zones, marine ecosystems and the species that flourish within them have incredible value — both to natural functions such as climate change mitigation and to the coastal communities that depend on them. Billions of people depend on the ocean for their food, livelihoods and recreational opportunities. The marine life that provide it — whether it’s fish to eat or whale watching trips that fuel the economy — these areas must be managed carefully and sustainably. In Marin County, our coastal zone covers approximately 82,168 acres of county land. Of this total, approximately 33,913 acres are owned and managed by the federal government (National Park Service). This leaves 48,255 acres of the coastal zone under county jurisdiction. The Marin County coastal zone consists of wetlands, lagoons, seagrass beds, reefs, and shallow bays which serve as nurseries or feeding areas for a variety of species. These areas have some of the most abundant biodiversity and endemism in the world. In addition, the coastal zone around Marin County is protected by marine sanctuaries (Cordell Bank/Greater Farallones) and marine protected areas. 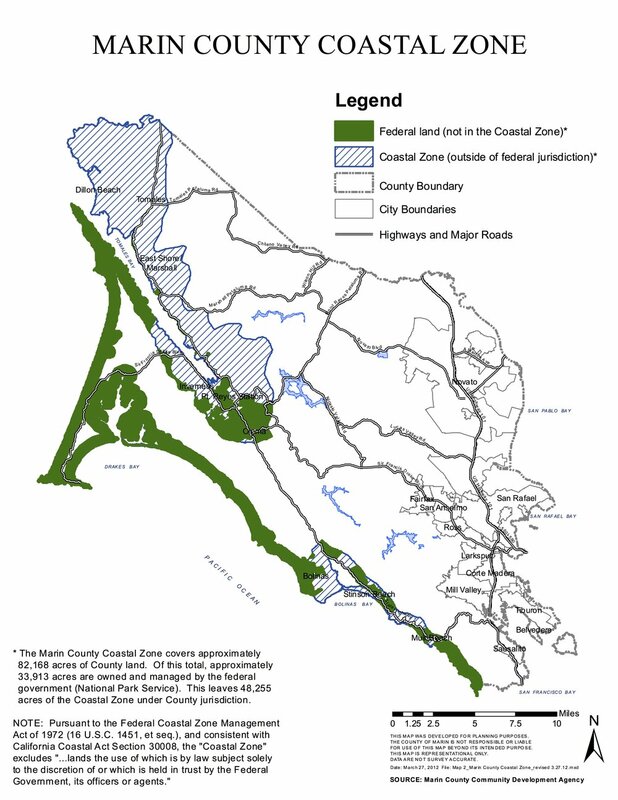 The use of the coastal zone is overseen by the California Coastal Commission and Marin County's Local Coastal Plan. EAC works collaboratively on our coastal and waters work with a broad base of Bay stakeholders, including our active role in the Tomales Bay Watershed Council and through our Waters Advisory Committee, which is made up of a Board sub-committee and key local environmental stakeholders including Tom Baty, Bruce Bowser, and Richard James. Our Waters Advisory Committee has developed a set of guiding principles for our work on issues facing Tomales Bay, Bolinas Lagoon, and their watersheds. Both Tomales Bay and Bolinas Lagoon are wetlands of international significance. A recent study confirmed that watershed groups like EAC and the Tomales Bay Watershed Council have a positive impact on local water quality. California's coast and ocean are among our most treasured resources. The need to safeguard the long-term health of California's marine life was recognized by the California Legislature in 1999 with the passage of the Marine Life Protection Act. This Act aims to protect California’s marine natural heritage through establishing a statewide network of marine protected areas (MPAs) designed, created, and managed using sound science and stakeholder input. In California we have 124 MPAs, which makes up 16 percent of the California coastal zone. In these MPAs, all human activities — from large-scale shipping to small-scale fishing — are regulated. On-going work includes working with partners on best management practices for Healthy Tomales Bay, marine debris issues, climate change, participating in the working groups, which helped develop the Sonoma-Marin Coastal Regional Sediment Management Report (CRSMR), stewardship activities and more.